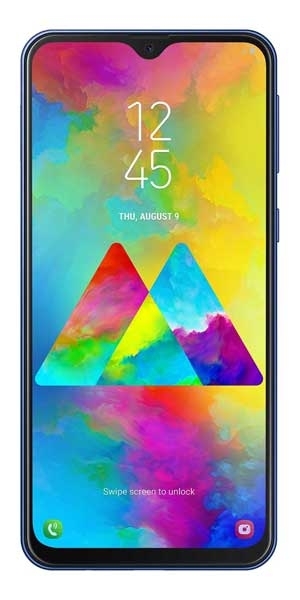 NanoFixIt Liquid Screen Protector is an anti-bacterial, anti-UV radiation, scratch resistant, hydrophobic invisible glass coating for mobile devices, cameras, and any glass surface on electronic devices. One package is for 10 devices. A single drop of NanoFixIt Titanium Liquid Screen Protector applied to the screen of your smartphone, tablet or laptop makes the glass Ultra Scratch Resistant. We protect your electronic screens against scratches usually caused by for example coins or keys that your smartphone is exposed to on a day-to-day basis. 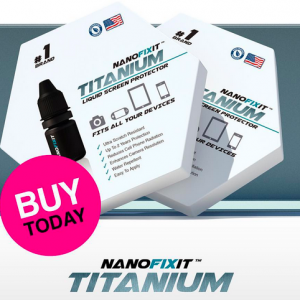 Nanofixit Titanium liquid screen protector completely replaces any other screen protector available in the market and is stronger than sapphire or tempered glass. Researchers have discovered that there are more bacteria on the average mobile phone than you will find in a toilet. Our technology contains titanium particles that have significant antibacterial benefits and ensure that your screen stays bacteria free. This anti bacterial coating also seals the glass surface making it less exposed to smudges and finger marks. Plastic screen protectors destroy the vividness and clarity of your original screen. With NanoFixIt Titanium your smartphone’s screen is crystal clear in the way the smartphone manufacturers intended it to be. In fact, the nanoparticles in NanoFixIt Titanium actually increase the vividness of your screen, its colours and brightness. The effect is so evident that you can actually lower the brightness of your screen and save battery life. 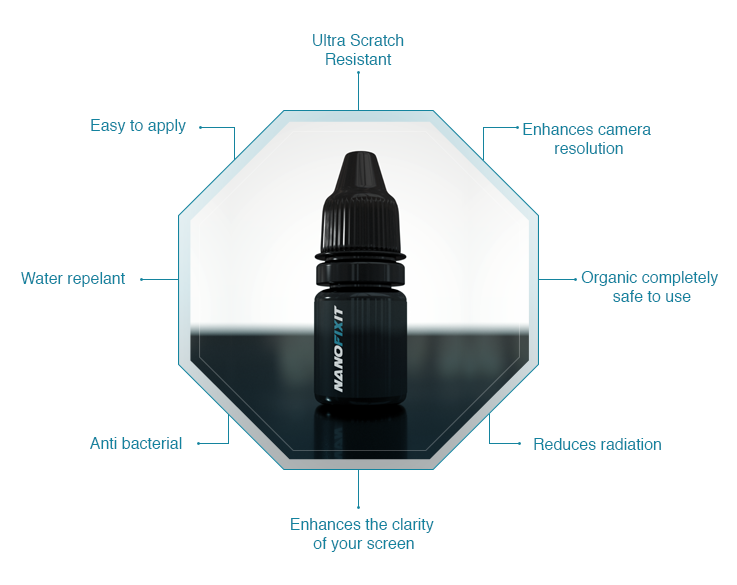 Several tests we have carried out clearly indicate that applying NanoFixIt Titanium to your front and back camera of your smartphone or tablet will increase the quality of the photos taken by up to nearly 50%. The reason for this enhancement is the fact that sealing your camera lens with NanoFixIt Titanium ensures that the UV rays travel in a straight line and are not shattered by micro holes in the glass surface. We call this the NanoFixIt ‘Pixel Enhancement Effect’.